I always find it fun to see what natural behavior my dogs show me, and then I take that and turn it into a trick. I have had many different trainers on my radio show as guests, and all of them say the exact same thing; see what your dog does naturally and then build on that. As spring comes around and you go outside with your dog, you will be surprised every year with a whole new array of small behaviors he has picked up. This is when I love to begin watching for something new and training for a new trick. I always pick only one behavior to work with at a time, and I do not move on to another step until we get it perfect. Before you begin, make sure you and your dog both know the basic sit, stay, come and down commands. Once you have mastered these, you are ready to move on. I have just taught my Little Man to jump through one hoop, and I am hoping to add another hoop as soon as I know he makes it through this hoop with no problems. Soon we will have a line of hoops to have him jump through. Remember, once your dog learns a trick and you have really practiced it, he never forgets it. Just remember to keep it in the routine to keep it fresh in his mind. This will be a fun summertime BBQ party trick. Choose a special treat that you will only use for this trick. Know what your cue word is going to be in advance. Give yourself at least six weeks to teach this trick and have fun! To start with, make sure you buy the kind of hula hoop that does not make any noise. Sometimes they have beads in them or things hanging from them that make noise. Later on down the road you can add things for your dog to jump through that are fancier; this is just the basic hoop to start off with. In horse riding, we put the rails on the ground when we are beginning to learn to jump. This also works when teaching a dog to jump through a hoop. Put the hoop on the ground, and have your dog walk through it. Be sure to praise him in a very high, happy voice, and give him a treat right away! Use your special cue word. I used the word "up." You can use many words, so find the word that is going to work for you. Maybe "up" for you means "up in to the car," so you may want to use the word "jump" instead. 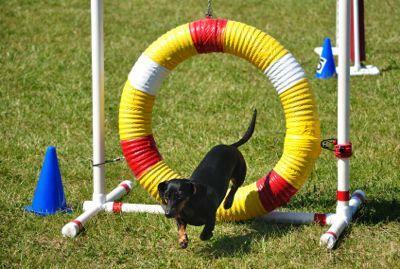 Once your dog is consistently walking through the hoop, begin lifting it up. Now have him walk through it that way. Again, praise him and give the treat right away. Make sure you both are having fun. Never do more than 15 to 20 minutes of training at a time. It is better to do this a few times a day than have a long training session all at one time. Your dog will have more fun and will retain more. Plus, he will be very excited to come back out to try again if you leave him on a high note. As he gets better and better, you can raise the hoop up higher and higher until he is actually jumping through the hoop. Once he is very excited and happy, try getting him to focus on you, and let him see where the treat is. Throw it a few feet right in front of him. This will help him to jump through to go fetch the treat. Now you have a dog jumping through a hoop. Remember, how high your dog can jump will depend on his size. Little Man can jump high, but not as high as my Lab, Senny, so adjust the hoop height accordingly. So, what do you use for that special treat? Cheese is wonderful, and you can cut it into small cubes so your dog doesn't get too much at one time. Another neat treat is peanut butter. You can put it on waxed paper by the quarter teaspoonful and freeze it. Your dog gets a wonderful taste, but not too much at one time. Want to make the peanut butter more interesting? Press bits of shredded cheese or whole wheat cereal rings into it. Now you have a healthy frozen treat that any dog will jump through hoops to get.